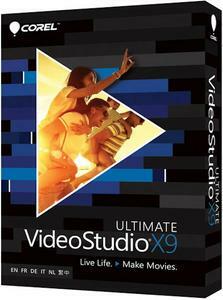 VideoStudio Ultimate X9 is designed for video processing and positioned as a simple solution for users. Among the latest innovations can provide support for Blu-ray Disc Movie Video (BDMV). Users can import files directly from BDMV Blu-ray-video cameras, to work with HD-video, animated menus and add projects to record Blu-ray, including double-layer discs. VideoStudio Ultimate X9 supports the capture, editing, authoring and maintaining video formats HDV, AVCHD, TOD (video cameras JVC HD) and BDMV. The program for editing and previewing files using low resolution, allowing for editing HD-video requires much less system resources. In VideoStudio Ultimate X9 also uses a new codec H.264, supports import and export video with the Apple iPhone and iPod Touch, improved upload videos on YouTube, is optimized to work with two-and quad-core Intel processors.